The door to discovery has been opened, and the traditional flow cytometry market is set to see a paradigm shift. 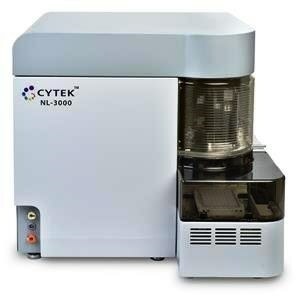 With its new Northern Lights series of advanced flow cytometry systems, Cytek Biosciences Inc. is making three lasers and more than 24 colors possible at a price point typically attached to systems with far fewer capabilities. Cytek™ Northern Lights is the latest in a series of technological advances that furthers Cytek’s mission to make full-spectrum flow cytometry accessible to a larger number of scientists. And they aren’t done yet. Northern Lights can expand with application requirements and can be upgraded from one laser (up to nine colors) to three lasers (beyond 24 colors), all while being priced more competitively than conventional three-laser flow cytometers. With only one optical configuration for all applications, time savings and a reduced occurrence of experimental errors are realized. Northern Lights’ unique optical design and unmixing algorithm combine to enable the use of a wide array of dyes, including those with highly overlapping spectra such as APC and Alexa 647 – a feat not possible using conventional cytometry. Additionally, Northern Lights makes going beyond 24 colors affordable. While conventional flow cytometers typically require five lasers, some of which are expensive and high maintenance, to achieve 18+ colors, Northern Lights enables the power of 24+ colors with just three relatively low-maintenance lasers. Northern Lights also allows for the use of any commercially available dyes that are excited by the onboard lasers, providing more opportunities for the use of lower-cost reagent options. Plate Loader: Cytek’s new plate loader offers ‘walk away’ capabilities. It supports 96 well plates, three throughput modes, and user customizable modes. The loader system seamlessly integrates into the Aurora and Northern Lights systems and offers the user the ability to switch between tubes and plates in a matter of seconds. Backed by Cytek’s comprehensive service plan offerings, the Northern Lights series is now available.